Ryan Companies US, Inc. and Lincoln Property Company have announced plans for a luxury, amenity-laden apartment tower in Chicago’s highly sought-after, downtown Gold Coast residential market, targeting the housing needs of discerning young professionals and savvy urban couples. The 31-story, 373-unit tower, now referred to as 833 North Clark Street Apartments, will be constructed at the southeast corner of Clark and Chestnut Streets on a 41,000-square-foot site that was purchased from U.S. Bank. A groundbreaking ceremony to celebrate the launch of construction was held at the site on Friday, July 24, just days after the development team purchased the land parcel and closed on an $88 million construction loan with U.S. Bank. Ryan Companies US, Inc. and Lincoln Property Company are serving as co-developers of the project. Ryan also will be the Design-Build contractor and Lincoln Property will be the leasing and management firm. The design team for 833 North Clark Street Apartments includes Ryan A+E, Inc., Design Architect; Antunovich Associates, Architect of Record; Studio K, Interior Designer; and TGRWA, Structural Engineer. The bank, also the previous owner of the 41,000-square-foot site, will continue to operate an adjacent office at the historic Cosmopolitan State Bank Building and rebuild its drive-through as part of the development’s parking structure. When it opens in early 2017, 833 North Clark Street Apartments will comprise 373 luxury apartments, including 78 studios and convertibles, 212 one-bedroom units, 76 two-bedroom units and 7 penthouse apartments. Unit sizes, except for the penthouses, will range from 563 square feet to 1,252 square feet. Penthouse units will range from 1,179 square feet to 3,250 square feet. The units have been designed to offer a unique combination of clean aesthetics, urban functionality and sophisticated design elements. Apartments will feature floor-to-ceiling (9’) glass windows to capture exceptional views in all directions of the Chicago skyline and Lake Michigan. Other unit features include chef-inspired kitchens, a full-sized washer and dryer, luxurious bathrooms, oversized walk-in closets and pre-wiring for high-speed internet and cable. Many units will have private balconies. The luxury offerings of the apartment community will extend throughout the building’s amenity-laden common areas, including the rooftop, fourth-floor terrace and ground floor spaces. 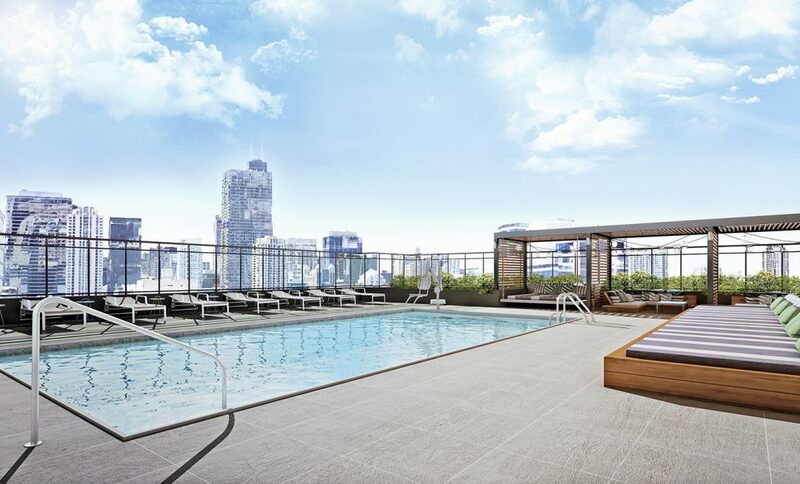 • The rooftop level, with panoramic views of the city, will offer a hospitality-inspired sundeck featuring outdoor pool, private cabanas and outdoor fireplaces. The rooftop will also have an exclusive resident lounge with a cyber café, party room with a gaming center, and an exclusive high-end fitness center. • An expansive green roof will be the signature of the fourth level which will also include a spacious private terrace with bocce ball courts, firepits and grilling stations. • Features of the first floor will include an elegant lobby, the management office and leasing center, secured resident storage and a private dog run with a grooming station. The ground floor will also include a library, resident lounge, business center, and conference area for the use of the building’s residents. These spaces will be fully-equipped with high-speed wi-fi. Stylistically, 833 North Clark Street Apartments is composed of two contrasting but notable Chicago architectural styles. The buff-colored solid massing, dotted with playful punched openings, is inspired by Chicago’s turn-of-the century architecture. It meets the street in a traditional manner, with granite cladding and repetitive storefront window bays. This style wraps the majority of the east, west, and south façades. In contrast, the north end of the building reveals an all-glass massing, inspired by Chicago’s Miesian tradition. This creates a dramatic vertical expression over the building entry. The striking presence of the glass wraps horizontally over the top of the building where it meets an outdoor amenity terrace, 300 feet above the street. The interior spaces will complement this aesthetic while weaving in a few surprises for the Chicago market. According to Walsh, the target market for the 833 North Clark Street Apartments, well-educated young professionals, urban couples and empty nesters, will appreciate its offerings of understated elegance, exceptional customer service and lifestyle convenience. 833 North Clark Street Apartments is located in one of downtown Chicago’s most mature, vibrant and historically sought-after submarkets, the Gold Coast. This location is ideal for residents living, working and playing in or near the Gold Coast. The site is situated in close proximity to transportation including two CTA stations and other public transportation options important to those who work downtown. It offers easy access to Lake Shore Drive and the Kennedy Expressway for those traveling by car to suburban destinations. The site is within walking distance of Chicago’s Magnificent Mile (North Michigan Avenue), the downtown CBD, the Northwestern and Loyola University graduate school campuses, and the Northwestern medical center. Located nearby are an abundance of restaurants, clubs, retail amenities, and cultural facilities. It is also within close proximity to the lakefront, from Oak Street Beach to Navy Pier. Overall, Ryan Companies is serving or has served as developer, owner, designer and/or builder on myriad multi-family housing projects, including senior living. Over the last 10 years these projects account for more than 5,300 units which have been placed into service or are under construction. Ryan’s most recent high-profile residential projects include: 222 Hennepin in Minneapolis, a mixed-use development with 286-unit luxury apartments over retail space; Downtown East, 195 luxury apartments that are part of a significant mixed-use development that includes 1.2 million square feet of office space in downtown Minneapolis, adjacent to the new Minnesota Vikings stadium; and Vintage on Selby, a mixed-use retail and multi-family housing development with 210 upscale apartments in St. Paul, Minn.